Thought I'd show you all my DIY mirror extenders. Unless you are 5ft 4 and 8 stone then the majority of jap sports bike mirrors are useless, I could only really see a pair of elbows out of mine - seeing the car behind involved leaning over and tucking my elbow in, not really ideal if you are looking for following police cars or cars approaching and looking to overtake. I Looked into buying some mirror extenders and they ranged from £25 for blocks of plastic under the mirror mounts to £60 for some stem extenders, neither of which were really going to be long enough for me. So, what other options are available to the perennial tight ****? DIY of course. I used a bit of wood with various holes drilled in it to decide how much longer I wanted my mirror stems and decided on 55mm, quite long but then I am taller and considerably broader than the average japanese motorcyclist. 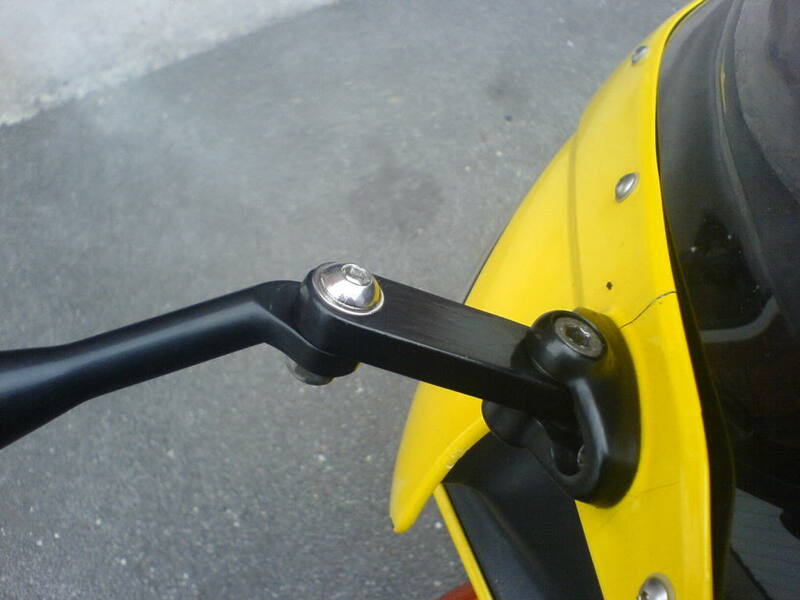 The design is VERY simple and could be adapted to suit lots of sports bike mirrors where the shaft bolts onto a mount, modern plastic jobbies and those that screw onto the handlebars are different. I'm not going to go into detail as it is pretty blatant; just measure out and cut 20x10 aluminium flat bar to length, centre punch and then drill holes in each end, shape the ends with a file, paint, fit button head allen bolts, a few washers and bolt it together with nyloc nuts. End result works brilliantly, they don't vibrate any more than the originals, have been tested at 130mph so far and and are solid enough that if pushed, the ball joint moves before the other joints in the stems - aesthetics are an acquired taste but who gives a **** . Figured this might help someone save a bit of cash.